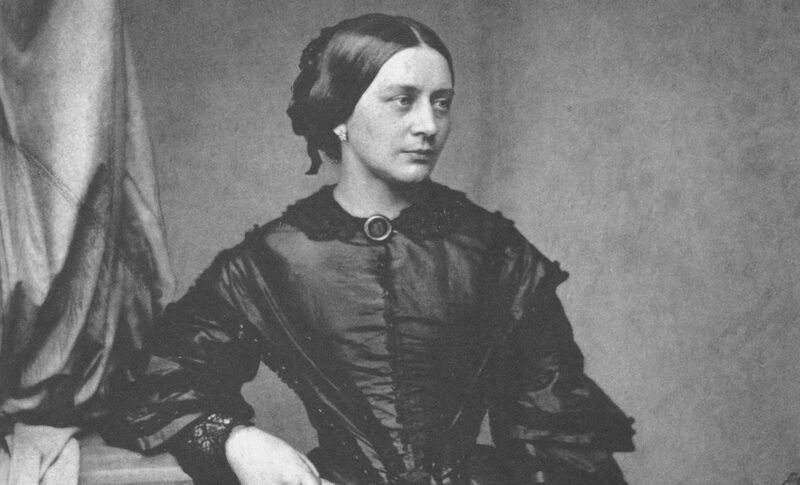 Clara Schumann (née Clara Josephine Wieck; 13 September 1819 – 20 May 1896) was a German musician and composer, considered one of the most distinguished pianists of the Romantic era. She exerted her influence over a 61-year concert career, changing the format and repertoire of the piano recital and the tastes of the listening public. Her husband was the composer Robert Schumann. She and her husband encouraged Johannes Brahms, and she was the first pianist to give public performances of some of Brahms’ works, notably the Variations and Fugue on a Theme by Handel. Clara was raised by her father as her parents divorced when she was four years old. In March 1828, at the age of eight, the young Clara performed in Leipzig, and met another gifted young pianist invited to the musical evening named Robert Schumann, nine years older than her. Schumann admired Clara’s playing so much that he asked permission from his mother to discontinue his studies of the law, which had never interested him much, and take music lessons with Clara’s father, Friedrich Wieck. As part of the broad musical education given by her father, Clara learned to compose, and from childhood to middle age she produced a good body of work. She was also one of the first pianists to perform from memory, making that the standard for concertizing. Trained by her father to play by ear and to memorize, she gave public performances from memory as early as age thirteen, a fact noted as something exceptional by her reviewers. At age fourteen she wrote her first piano concerto, with some help from Robert Schumann, and performed it at age sixteen at the Leipzig Gewandhaus with Mendelssohn conducting. Robert Schumann had been attracted to Clara since she was fifteen. In 1837, Schumann asked her father Friedrich for Clara’s hand in marriage, but he refused. During the next year, Friedrich did everything in his power to prevent her from marrying Schumann, forcing the lovers to take him to court. During this period Schumann, inspired by his love for Clara, wrote many of his most famous Lieder. They eventually married on September 12, 1840. Clara continued to perform and compose after the marriage even as she raised seven children, an eighth child having died in infancy. In the various tours on which she accompanied her husband, she extended her own reputation beyond Germany, and her efforts to promote his works gradually made his work accepted throughout Europe. Although Clara composed nothing after the age of thirty-six, today her compositions are increasingly performed and recorded. Her works include songs, piano pieces, a piano concerto, a piano trio, choral pieces, and three Romances for violin and piano. Inspired by her husband’s birthday, the three Romances were composed in 1853 and dedicated to Joseph Joachim, who performed them for George V of Hanover. He declared them a “marvellous, heavenly pleasure”. Clara was also the authoritative editor of her husband’s works for the publishing firm of Breitkopf & Härtel.